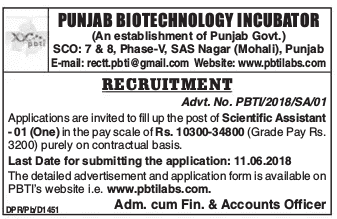 Punjab Biotechnology Incubator (PBTI) has given a notification of 01 Scientific Assistant Vacancies on the contract basis for a period of 05-years extendable as per the requirement. The interested candidates can apply for PBTI Recruitment 2018 on or before 11 June 2018. PBTI Mohali Recruitment 2018-19 notification is out. As per the Notification, there is 01 Scientific Assistant Vacancy. The educational qualification is the Master’s degree in the relevant field. The maximum age limit is 35 years. If you are looking for Govt. Jobs in Mohali Punjab Biotechnology Incubator then this article is going to be very helpful for you. 1st class Master’s degree in Basic/Life/ Environment Science/ Food Science or 1st class B.Tech or equivalent in Biotechnology/Food Technology/Dairy Technology or 1st class B. Pharma from a recognized institute. Rs. 10300-34800/- (Grade Pay Rs. 3200). Demand draft of Rs. 500/- in favor of “Punjab Biotechnology Incubator” payable at Mohali. Kindly mention your name and post applied at the back side of demand draft. You can send your application accompanied with the copy of matriculation certificate, qualification mark sheets, experience certificates, community certificates (if any) and demand draft of application fees to the department on or before 11.06.2018. A soft copy in M.S. word format of the Performa-II is also required to send by the candidates through email on PBTI’s email address at rectt.pbti@gmail.com.